Welcome to Audiko.net! 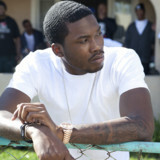 We propose to download a free Meek Mill ringtones for your iPhone or mobile. Take your favorite episode from your favorite piece of music - Meek - Mill - The - Trillest - Instrumental, Coke Boys feat. Meek Mill - Closing Up Shop ], Meek - Mill - Monster - Instrumental - Prod. - By - Jahlil -, or any other track. Then download the prepared Meek Mill ringtones to your cellphone, and enjoy philly music by Meek Mill every time your phone rings. Depending on a phone model, you can have your tone both in the MP3 and m4a formats, played by both mobile phones and iPhones. Just select a track, and choose free Meek Mill ringtones download option.